Convention life is a maelstrom of standing in lines, shoving your way through dealer rooms, and checking your schedule app for the fifteenth time. 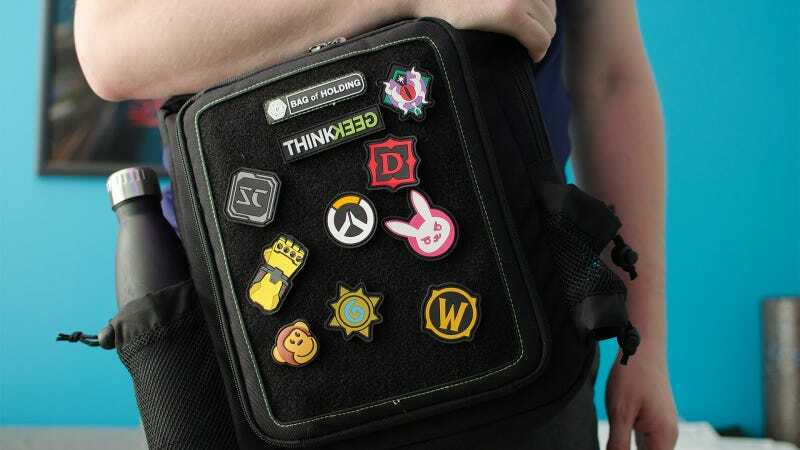 To get through that nightmare, ThinkGeek’s con-going bag is perfect. I’ve been going to Dragon Con in Atlanta since 2011, with dozens of other cons large and small interspersed between them. Yet in all my time going to conventions, I hadn’t found a bag that was really good for it. I used to carry a backpack, but that got cumbersome quickly. I’ve tried laptop bags, but those are easiest to dig through when they’re sitting on a desk or a table, not walking through a crowded show floor. Consequently, they usually stayed in the hotel room. Nothing was really all that useful for walking around the convention floor. Then I found the ThinkGeek’s Bag of Holding, engineered specifically for cons. The soft velcro front of the bag is designed to hold your collection of patches, which are becoming an increasingly common con collectible. They are a little easy to pull off the bag in a crowd, but if you’re worried about patch burglars, you can always sew them on properly. The bag even comes with an example of sewed-on and velcro patches to get you started. The shoulder strap has an extra fabric strip for your pins. If you’re more of a pin collector, the shoulder strap features an extra, thinner piece of fabric where you can display your pin collection. I found it slightly annoying to adjust the strap’s length, but it’s not like you have to do that often, and showing off pins is worth it. At cons, your collections become a conversation piece, so they’re worth putting on display. Inside the bag is where this bag really gets interesting. Many of the interior pockets are designed to face, so you can easily get into them without taking the bag off your shoulder. Unlike other backpacks, this bag assumes you’re opening it while standing in line, as opposed to sitting half open on a desk in front of you. Inside the largest pouch, there’s a slot for your phone right on top, as well as a second phone-sized pouch in the smaller section that could fit a USB battery pack. The front pouch also has a sleeve for small tablets and Kindles, if you need something to read while you’re waiting to get in to a Rob Paulsen and Maurice LaMarche panel. One of the most eye-catching features, though, is the iPad case. The front pouch opens at a right angle, supported by two small green straps. Inside the pouch is a clear vinyl pocket where you can place a large tablet. ThinkGeek claimed that you could still use the touchscreen through the vinyl, and I was skeptical, but yet it was true. While it’s not the ideal way to use an iPad, it was perfectly possible to unlock the tablet, swipe through notifications, and pull up my convention schedule through the little window. All without taking my bag off my shoulder. The Bag of Holding also contains space for those giant program books so many cons give out now, as well as two slots on the side for water bottles. Notably, neither of these expand very much. At first glance, this feels like an oversight, but it helps the bag maintain its small profile. Put simply, it’s very hard to overstuff this bag so much that it gets in the way in a crowded hall. It will always feel slim and comfortable. When you’re pressed together with 500 strangers like sardines because you have to get John Barrowman’s autograph, that compressed design will start to feel a lot more like a feature than a bug.